John Rushout, 2nd Lord Northwick, pre 1854-1859, Cheltenham/Gloucestershire/England, Described in the catalogue 'Hours in Lord Northwick's picture gallery: being a catalogue with critical and descriptive notices of some of the principal paintings in the Thirlestaine House collection, Cheltenham', published by Henry Davies, Montpellier Library & Hall and Virtue, London, 1854: 705. 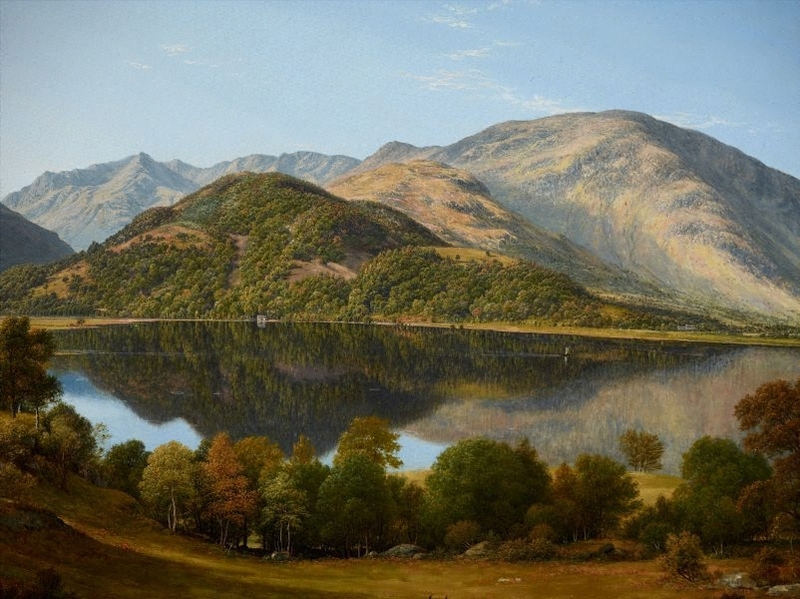 'View of Ulswater [sic]: Morning'. Glover. This and No. 713 form a pair. They are accurate deliniations of the scenery represented, with its atmosphere of lights and shadows forthfully preserved - the treatment and manner quite in the style of this once popular artist. Phillips International Auctioneers and Valuers, 26 Jul 1859-16 Aug 1859, Cheltenham/Gloucestershire/England, Sold through Phillips International Auctioneers and Valuers at the sale 'Catalogue of the late Lord Northwick's Extensive and Magnificent Collection of Ancient and Modern Pictures', at Thirlstaine House, Cheltenham, held 26 July - 16 August 1859, lot no. 1154 'View of Ulswater - morning', to Sir Thomas Phillips, Worcester. Thomas Phillips, post 16 Aug 1859-pre 1872, Cheltenham/Gloucestershire/England, Purchased by Sir Thomas Phillips from the sale 'Catalogue of the late Lord Northwick's Extensive and Magnificent Collection of Ancient and Modern Pictures', through Phillips International Auctioneers and Valuers at Thirlstaine House, Cheltenham, held 26 July - 16 August 1959, lot no. 1154. 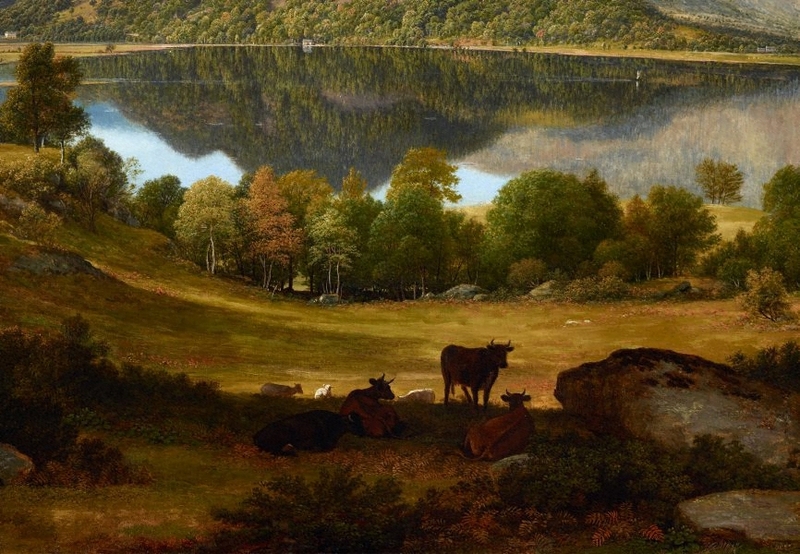 Possibly sold at at auction 'Pictures at Middle Hill, 1862' through Phillips International Auctioneers and Valuers, held at Middle Hill, Worcester, 1862, lot no. 40. Sir Thomas's estate of Middle Hill was a modest late 18th-century house situated near Broadway, Worcester, and was Phillipps's home from early childhood until 1863, when an escalating feud with his son-in-law James Orchard Halliwell-Phillipps (on whom the estate was entailed) precipitated Sir Thomas's removal to Thirlstaine House, Cheltenham. James McKinnon, post 1872-pre 1979, London/England, Purchased by the Art Gallery of New South Wales from James McKinnon. McKinnon was unable to provide any further information regarding provenance of the work. John McPhee. 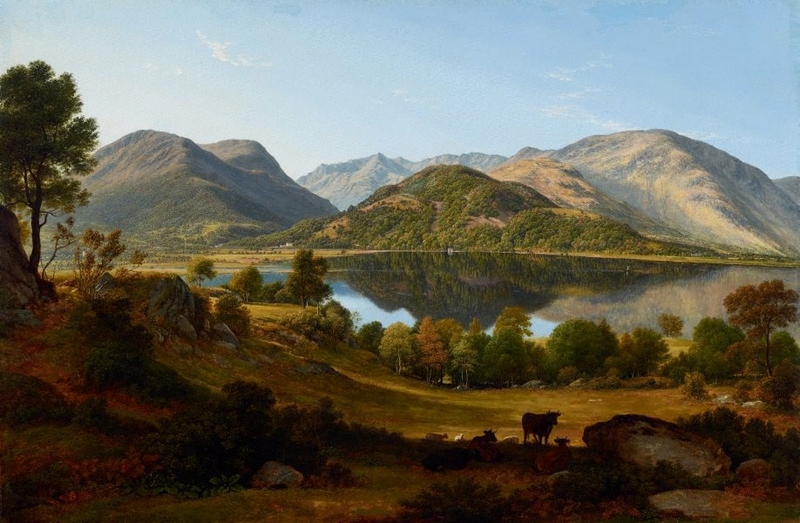 Australian Collection 1., Art Gallery of New South Wales collection series , 'John Glover: Ullswater from Patterdale', Sydney, 1981, colour illus.. I blame Duchamp: my life's adventures in art , 'John Bull and the Little Boy at Manly', pg. 321-333, Sydney, 2009, 327, 328. Art Gallery of New South Wales catalogue of British paintings , Sydney, 1987, 69 (illus.). The pursuit of wonder , Carlton, 2005, 39 (colour illus.). Terry Ingham, The Australian financial review , 'Saleroom', Sydney, 09 Aug 1979, 17 (illus.). Michael Rosenthal, The Burlington Magazine , 'John Glover: Hobart and Adelaide', pg. 289-290, London, Apr 2004, 290 (colour illus.). Review of the John Glover retrospective organised by the TMAG. Unknown, Sunday Times Culture , 24 Sep 2006, (illus. ).